For the month of October 2013, every evening from 7pm onwards, Sentosa 4D AdventureLand presents Fright Nites with 2 spooky simulation experiences. First in Singapore, go on “Panic House” a 4-D thrilling horror ride as your host morphs into monsters and trapped you!! Next, focus on staying alive as you slay the zombies in this 4-D interactive game “The Grip of The Undead”. Come join us for 9 special nights in October as you walk through the haunted trail of “TRAPPED”. Witness the story of once an angelic ballerina who died under the curse of a jealous fellow dancer. The vengeful spirit of this young girl now lurks in the depths of this trail, preying on innocent souls to seize them forever! 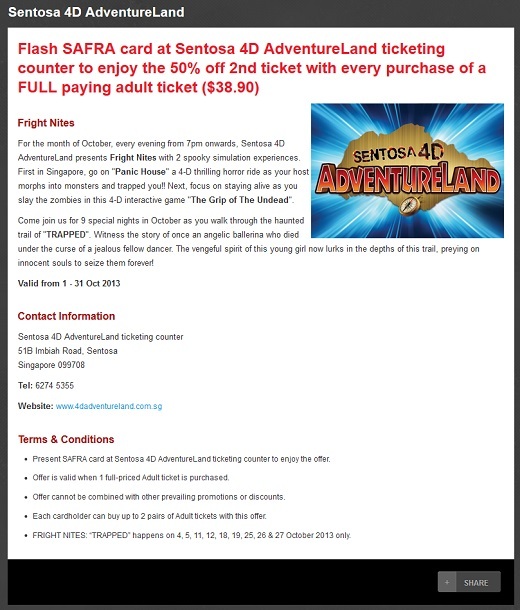 Flash SAFRA card at Sentosa 4D AdventureLand ticketing counter to enjoy the 50% off 2nd ticket with every purchase of a FULL paying adult ticket ($38.90).